There are four subtypes of rosacea. Rosacea patients may have more than one subtype at the same time. The subtypes can progress from mild to severe, which makes it important to treat rosacea early in its course. What Is Subtype 2 Rosacea? 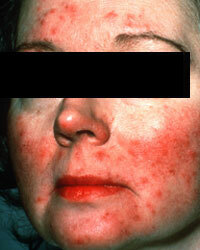 Rosacea subtype 2, also referred to as papulopustular rosacea, causes bumps and pimple-like lesion on the face. The symptoms of rosacea type 2 may occur along with the facial redness and flushing of rosacea subtype 1. While the papules and pustules of subtype 2 rosacea may resemble acne, there are generally no blackheads or whiteheads present in rosacea alone. The bumps and pus-filled lesions of rosacea subtype 2 (papulopustular rosacea) tend to respond well to treatment. Topical Medications (applied to the skin), including azelaic acid (Azelex®, Finacea®), metronidazole (MetroGel®), sulfur and sulfacetamide (Plexion®, Klaron®). Rosacea symptoms may start to improve within the first month of using topical rosacea medications. However, it usually takes about two months of use to notice significant results. Anti-inflammatory Dose Doxycycline (Oracea®). Doxycycline is used most commonly as an antibiotic for the treatment of bacterial infections, including acne. However, doctors rely on its anti-inflammatory properties when prescribing it for rosacea. When prescribed for rosacea, doxycycline may be prescribed in low doses of 40mg. This is referred to as an “anti-inflammatory” dose. This amount is below the standard antimicrobial dose of doxycycline that kills bacteria. The low dose reduces the risk of developing side effects associated with antibiotics and of developing bacterial resistance. Oracea® is the brand name of doxycycline that has been formulated to provide anti-inflammatory effects when taken once a day. It’s low dose formulation makes it safe for long-term use. Oral antibiotics (doxycycline, erythromycin, tetracycline) Oral antibiotics are effective for reducing the bumps and pustules of rosacea. Results may be seen in 3 to 4 weeks. Since antibiotic resistance can develop when an antibiotic is taken too frequently or for too long, a topical antibiotic or anti-inflammatory dose doxycycline may be prescribed once the rosacea is under control. Oral and topical medications may sometimes be prescribed for use at the same time. This combination of treatments may provide additional benefit. Initial treatment may be followed by long-term rosacea treatment with an oral or topical medication alone to keep symptoms under control. There are a variety of rosacea skin care tips that are helpful for avoiding rosacea flares. Work with with your doctor to establish a skin care regimen that includes the daily use of sunscreens, gentle cleansing, and the use of skin care products that don’t burn or sting. Many people report that their rosacea symptoms worsen after being exposed to certain triggers. Some common rosacea triggers include sun exposure, spicy foods, hot baths and emotional stress. A rosacea diary can be very useful for tracking rosacea symptoms over time and identifying possible triggers, so that they can be avoided.